I've tried to explain the disadvantages it has in my previous post. They are especially visible in your scrolling example. This might happen if something consumes GPU-time when you start the miner, e.g. if it's also used to render the screen. This is how an average value works mathematically, it doesn't detect something there is also no way to speed up it, since it wouldn't be an average anymore. 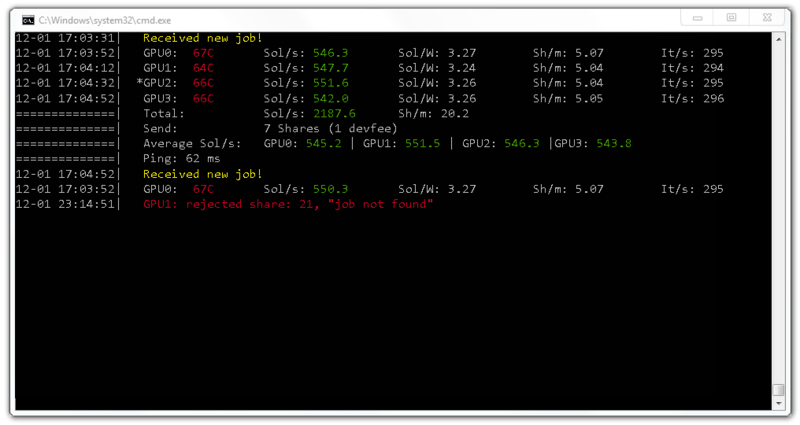 It would be great to have like SGminer a console where you have a fixed dynamic top that show all the summary information like on the web interface (pool, uptime, gpu's, efficiency and so on), then under this make the scrolling log. I find this interface to be the best. Same here, a little annoying to have multiple workers on NH stats page but not a deal breaker, it still has better performance than NH Excavator and EWBF. When i start the miner i get a lot of "Share above target" but after a few minutes it works like a charm. Just upgraded to 0.5.6 a few minutes ago, will report back later. You can always use the telemetry server implemented. It has really nice clean interface. dstm, here's my suggestion for the telemtry server i wanted to post a while ago: a way to sort columns so we can identify quicker the less efficient GPU, lowest hashrate, hottest, etc. Maybe using datatables.net plugin? I know you tried to keep it as light as possible but using datatables.net would save you a lot of time. If you want i could help, send me a private message. That's why i stated above "like on the web interface", i was speaking about how the console actually look. I obviously use the telemetry already, but just if we want a "cleaner" console. 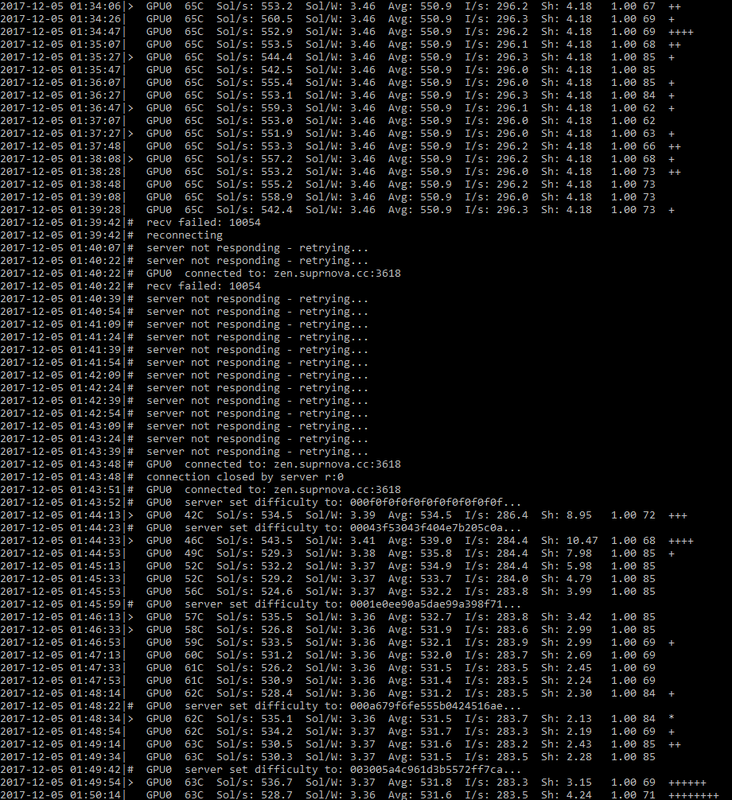 ncurses console does not play well with running under systemd. Really want to hear what dstm think about this. Maybe the best suggestion so far. I'm getting these all the time on NH pool. Sometimes it's every 24 hours, but sometimes it's few times a day. My friend on different setup, different ISP, and still have the same problem at the same time as me. Sorry, I didn't see your reply. I was focused on second post. On the one hand you've right to see it in a compact form, hovewer on the other hand it doesn't look clearly becuse there are too much "compressed" informations. Like --time parameter, maybe could you think about disabling few of printfs such as iterations and shares? Later I will think on other proposal how to get it look more clearly if u don't mind. It is logical, hovewer I'm connected to iGPU (integrated graphics). So it is strange because no one program - except miner - interfere with graphics card. I know, but as I've shown on my gif the average looks a bit strange in my case because it's increasing and increasing for many hours until it will achieve it's operating point. In my opinion taking into consideration latest 100-200 records (circular buffer) should be fine. Thx for this example. It has the advantage of having a static region for stats so it's easy to read - however it has also disadvantages - you have no history (you can't scroll) so you can't see how things evolve, there is also no correlation between events and performance values, which are very useful if something goes wrong - using curses has also it's own disadvantages. There are not that many lines you have to check also you have usually to check each GPU as a whole separately - so I don't think this provides real benefits. 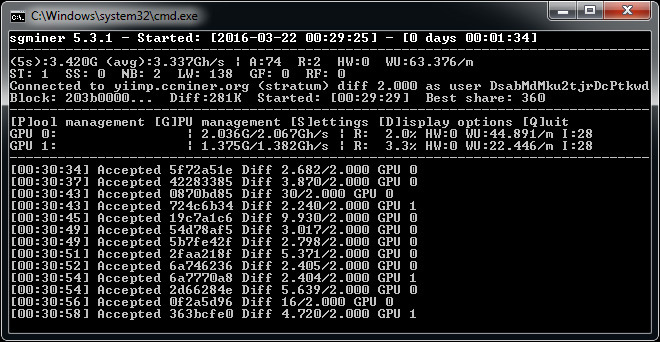 Iteration are very useful since it's a good way to measure the performance of your GPUs. The solution rate isn't a good measure for this since it's probabilistic. Thx, all suggestions are welcome. The average has manly two purposes, it's useful for people who are running their systems for long periods: the performance may vary during this time because of thermal conditions or CPU-load caused by other processes - so an overall average is very useul. It also there to be able to check the solution rate reported by the pool. This looks strange, it's a pretty significant difference, I've never seen such a behavior on my systems. Do you have other systems to check if this is reproducible? Anyone got frequently hashrate drop problem recently (Drop to 0 in about 20 mins, but when I checked miner, it still hashing as normal)? Look like after few days, it happen again to all of my miners. I mined in flypool, asia1 server, port 3333. Simple question: does DSTM support 1070 Ti? Thinking of building a new mining rig based on exclusively these GPUs. anyone having issues with 12 cards running in DSTM on linux? works fine with ewbf // anything I need to add or change? I downloaded the Winx64 version Version 0.5.6 and the SHA-1 hash does not match. Ahhh I just hashed the zip. They will probably rely on the log feature for the old infos, and on the console for a quick glance like you do with the webui. I know that's what i do even if i seldom connect to see the console. I will say I may be having a connection issue with my 12 card on it though. .
EDIT had to take my 12 card off of DSTM . . not working properly any idea DSTM?